One of my favorite wetland flowers to photograph is the White Water Lily (Nymphaea tuberosa).However it can be a challenge to get a good wetland landscape image because of their environment. Water lillies are unique in that they are only open during the middle of the day so the best time frame for an image is around 10 am to 2 pm. As the season wears on the pads begin to curl up so the best time is early in the season. I was looking for ‘clouds with character’ to work with. 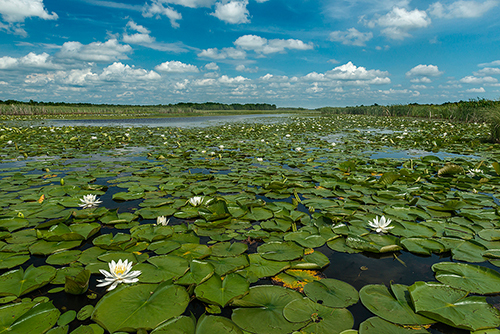 I think one of the best places to photo water lillies is Crex Meadows WMA, WI . However last year Phantom Lake was drained so I really had to search out a good spot. I found this location right off County Road F. I put on my chest waders and waded into the muck and yuck. I like some lillies close to the camera and others creating a pattern to the background. It took a while to achieve but I liked this composition. Side note: If you like to wade into this type of environment be sure to have lens and filters already installed, do not switch while in the muck. I still have a $120.00 GND filter in the bottom of Phantom Lake. 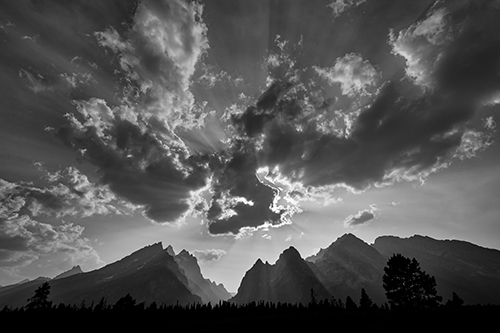 This shot was taken on a family trip to Yellowstone and Grand Tetons in August. For most of the trip there was a lot of hazy smoke in the air, at times completely hiding the peaks. When I saw this scene I had to find the next pullout and try to capture it. I placed the sun behind the clouds for the edge lighting and the sun rays created by the smoke in the air. I also selected a wide angle lens aimed upwards to include more of the clouds in the sky, matching some shapes with the mountains below. I converted it to monochrome to focus on the many shades from light to dark, the high contrast and the silhouettes from foreground to back. Technical Data: Full frame dslr, 16mm, f/11, 1/250 sec. This image was made in our front yard in Shoreview Minnesota. Unlike most of the neighbors, we don’t have any grass or landscaping, so the local deer are frequent visitors. We don’t interact with them, but they’re certainly used to seeing us around and are reasonably comfortable with us. These two bucks were also comfortable with each other. 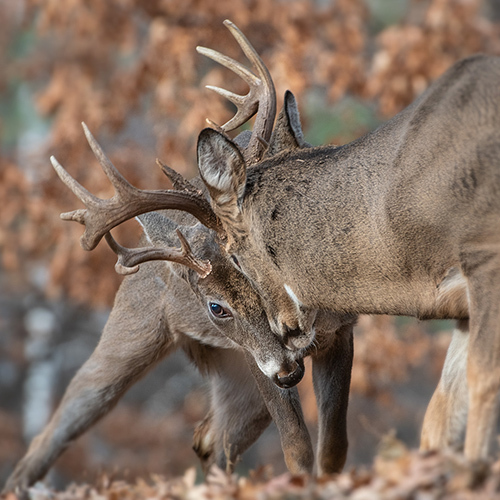 We had seen them peacefully browsing together even during the height of the fall rut. However, this November afternoon, the smaller buck kept initiating jousting sessions. I managed to catch the moment that the dominant buck half-heartedly lowered its head and pushed its companion back three feet, before resuming its feeding. I have become a little bored with the deer at Fort Snelling so I have been out to greener and a little more wilder pastures. 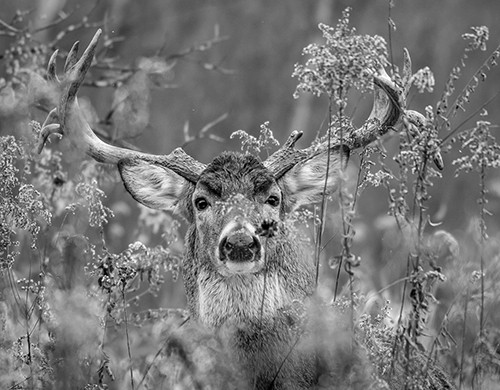 I actually spied this guy last year at about this time, and vowed to do my best to find him during the next rut. As luck would have it and after numerous trips and many hours searching I finally spied him one morning. He was partially hidden by the trees and about 250 yards away. He posed there like the King of the forest long enough for me to see it was the drop tine buck. He had a massive rack and his neck swollen with the rut in full gear. That was enough to keep me going. Within the next week I was waiting in a natural blind, basically a group of trees, and I saw him come out of the brush about 100 yards away walking towards me. I started to get ready but before I was actually set he popped up in the brush about 15 yards away. I know I was more startled than he was. I had to adjust my zoom back and started shooting hoping my settings were okay. I felt there was too much brush around his face but I kept at it and hoped I got one image with his eyes and nose clear of the brush. I did get a couple. I processed this image in black and white in Lightroom. A friend and I rented a boat and went out to try to photograph loons and grebes one early June morning on Clearwater Lake. 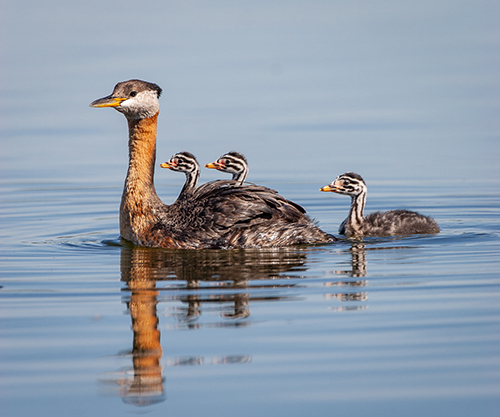 We were very fortunate to find this grebe family in great light so I took dozens of photos. I liked this one which captured the mother and the chicks in nice light and with a decent reflection. Technical detail : Canon , 500mm lens, hand-held, 1/640 sec. at f/8, ISO 400. 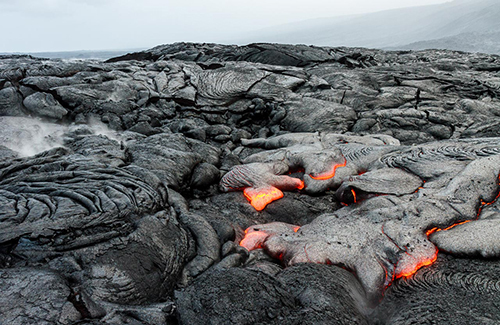 In my opinion a visit to Hawai’i is incomplete without visiting Hawai’i Volcanoes National Park on the Big Island. During a visit in January 2018 I was fortunate to be able to hike out onto the lava fields just outside the park to view and photograph the fresh, hot lava coming from the PuʻuʻŌʻō vent. The approximately 7 mile round trip hike started at 4 am (because it is easier to photograph lava at dawn). The hike was over rough broken lava with no marked trail in the dark in the rain. This is one of several images that I captured that rainy morning. The hot lava at this point is actually cool and firm enough to walk and stand on. Of course I did just that. The flow was moving very slowly. I set up my tripod to capture this image of the lava flow with the hills and steam/mist in the background. Technical data: Canon 7D, Canon 17-55 f/2.8 IS lens, Manfrotto 055MF4 tripod, Kirk BH-3 ball head, ISO 400, f/8, 1/15s, 17mm , two second timer with live view, Lens Coat rain cover. 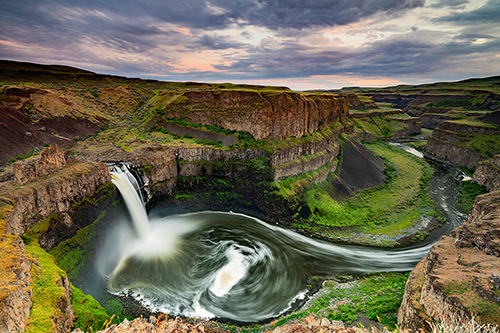 Palouse Falls, located in Washington State, was taken during a photo workshop with the Cold Snap Photography group lead by John Gregor on May 16, 2018. Out of all the locations we photographed this was the location I was looking forward to the most. This location offers dramatic scenery. The weather was typical for early Summer evenings with high heat during the day and cooling temperatures during the night. We were all concerned, however, due to reports that bad weather was moving in quickly from the West. We had to rearrange our schedule to beat the weather or getting the perfect shot of the falls was going to be challenging or perhaps even a total wash. Upon our arrival temperatures were dropping and overcast clouds were moving in fast offering us the drama the falls are known for. It was perfect! The excitement seeing Palouse Falls for the ﬁrst time was like being a small boy waking up on Christmas morning. I found a precarious spot, a ledge with no border protection overlooking the falls where if I had taken one wrong step I could have easily fallen to my death. I was nervous setting up my camera being careful and making sure my footing was solid. I took several shots each with varying exposure times, ISO’s and aperture settings. My goal was to get the emotional feeling of the swirling water below, the simplicity of the falls and the colorful, setting sunset in the background.